Below is a schedule of conventions, book fairs, and bookstores where I will be appearing and places I've appeared recently. Follow the links in each listing for more information about the events. April 12-14, 2019. I will be a featured writer at El Paso Comic Con in El Paso, Texas. March 8-10, 2019. I will be a panelist and vendor at Wild Wild West Con in Tucson, Arizona. February 10, 2019. 3:30-5:00pm. I will discuss Owl Riders at the Tucson Steampunk Society Book Club Meeting at Antigone Books on Fourth Avenue in Tucson, Arizona. November 8-11, 2018. 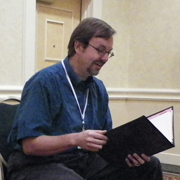 I was a participating author at TusCon in Tucson, Arizona. October 19-21, 2018. I was a panelist at MileHiCon in Denver, Colorado. October 5-7, 2018. I was a panelist at the Gaslight Steampunk Expo in San Diego, California. August 31-September 1 2018. I was a panelist at CoKoCon in Phoenix, Arizona. August 24-26, 2018. I was a participant at Bubonicon 50 in Albuquerque, New Mexico. June 23-24, 2018. I was a participant at LepreCon 44 in Phoenix, Arizona. June 13, 2018, 1:30 pm I gave a presentation about my Clockwork Legion novels at the Branigan Library in Las Cruces, New Mexico. May 25, 2018, 3-6pm. I signed my vampire novels and Owl Riders at Boutique du Vampyre in New Orleans, Louisiana. April 13-15, 2018. I was in artists' alley and on a writer's panel at El Paso Comic Con in El Paso, Texas. March 10, 2018. I was on panels at the Tucson Festival of Books in Tucson, Arizona. March 2-4, 2018. I was a panelist and vendor at Wild Wild West Con in Tucson, Arizona. November 11-13, 2017. I was a participating author at TusCon in Tucson, Arizona. August 25-27, 2017. I was a participant at Bubonicon 49 in Albuquerque, New Mexico.